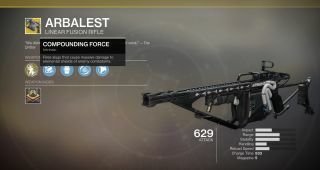 Destiny 2: Season of the Drifter introduced a new pair of Exotic gauntlets for each class, along with a new kinetic Exotic linear fusion rifle called the Arbalest. The thing is, nobody's been able to find the Arbalest just yet. According to newly datamined information, that's because it's tied to the Revelry event coming later this spring. As Eander explained on Reddit, a new backend item entry for the Arbalest shows it's sold by Eva Levante. Eva previously served as the main vendor for the Dawning, last year's winter seasonal event. (The same entry mentions Yuna, an Asia-exclusive Exotic vendor who most Western players probably haven't heard of, but we can ignore her for the purposes of this article.) The updated listings for Eva's inventory also show the Arbalest as a purchasable reward, and if you dig through the manifest code, you'll find that it costs 300 units of - presumably - whatever currency is tied to the Revelry. Revelrings, maybe, I don't know. The trail doesn't end there. A separate listing for the as-yet-unnamed currency features several daily bounties tied to the Revelry. Their tasks range from "Trigger Revelric Light with precision final blows in Crucible or Gambit" to "Get ability final blows in Crucible or the Black Armory Forges." Each daily bounty seems to yield 25 units of the event's currency, so assuming there are no extra steps involved, you'd need to clear 12 bounties to claim the Arbalest. That said, I'm willing to bet there's more to be done. Several Revelry bounties also mention a new activity (and/or area) called the Verdant Forest as well as "Inaugural Revelry Armor," so I suspect obtaining the Arbalest won't be as simple as just completing 12 bounties. I have to wonder if it's tied to the other Exotic quest shown on the Destiny 2: Joker's Wild content roadmap. We'll find out soon enough. The Revelry is still weeks away, but Arc Week has already started. Find out more in our rundown of the latest Destiny 2 patch notes.